Grilled Caribbean Shish Kabobs are one of our favorites on the grill! Pineapple, marinated chicken, and bacon wrapped bananas, it's a vacation on a stick! Marinate chicken pieces in teriyaki or peanut sauce for at least 3 hours. Cut bananas into about 5 pieces each. Slightly cook the bacon slices so you can pat off some of the grease, but don't cook them too long because you want them long and soft enough to wrap around the bananas. Then lightly coat the bacon in maple syrup. 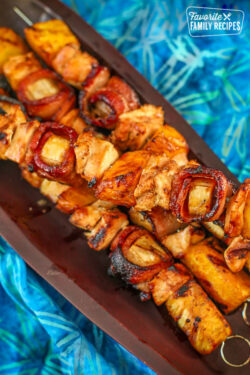 Wrap the bacon around the bananas and put them securely onto skewers alternating with chicken and pineapple. Grill over medium heat until chicken is cooked through. Optional: Brush on more teriyaki sauce to the skewers while they are grilling.